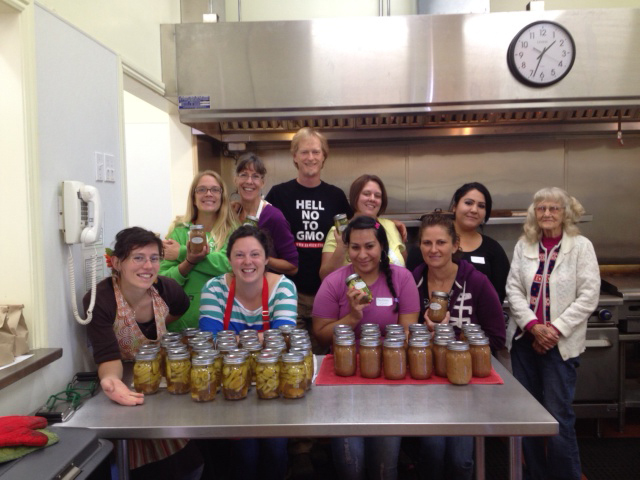 Last Saturday I taught a canning class sponsored by North Coast Opportunities at the Willits Grange. 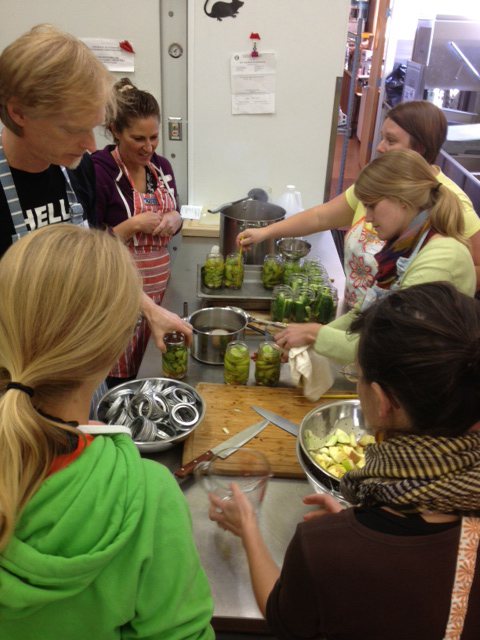 We had 10 people come out and spent four fun hours cooking and canning 54 jars of applesauce and green tomato pickles. It was awesome. The food we were canning would otherwise have rotted on the ground. Canning is not as scary as people think it is. I wrote a two-part series for Eat Mendocino about preserving food. First I talked about making refrigerator pickles, and then I explained how to preserve them using a water bath. I’m not on Facebook, but apparently there was some outcry that I had not followed the proper steps for food safety (which, for the record, I did). While I appreciate that people want to avoid introducing bacteria into their canned food, I also think our fear-based societal inclinations prohibit us from doing a lot of perfectly safe activities. Back in the day, people didn’t even bother with waterbathing or pressure canning! My grandma still makes shelf-stable apple butter without putting it through a waterbath, and although I personally take that extra step, she has never killed or made a single member of her family sick using this method. My mom says she has a two-year-old jar of that apple butter in her pantry, and at Christmas I won’t hesitate to open it up and spread it on a piece of toast. And if there happens to be mold on the top of it, well… that’s a bummer, but it’s easy to spot and we won’t eat it. Use your eyes and your nose. If it looks good and smells good, it’s good. I recently invented the statistic that you’re more likely to die from a shark attack than botulism. If you’re one of those people who doesn’t go in the ocean for fear of sharks, then maybe canning isn’t for you. But for the rest of you, food preservation is a fun, easy, and relatively risk-free way to keep the flavors of summer alive in the winter months. This entry was posted in Mendocino at large, Recipes. Bookmark the permalink.